Kimberley - The Highveld Lions have the chance to clinch top position on the One Day Cup log and secure a home final if they can beat the Knights in their clash in Kimberley on Wednesday. The Lions are top of the table with 28 points, four ahead of the Cape Cobras, thanks to five wins and just two defeats from their nine matches heading into the last round of the group phase matches. If the men from Johannesburg win the match against the Knights they know that nobody can catch them and coach Geoffrey Toyana is pleased that his team’s destiny is in their own hands. “We said at the start of the season that we would not be depending on anybody but ourselves,” he said. “If we win we are in the final and even if we lose we will host the semi-final. The boys are in good spirits and it is a good challenge for the guys,” he added. 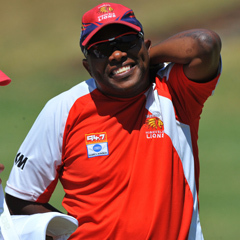 Toyana is in his first season as the Lions coach and he has already taken the team to the final of the Champions League Twenty20 but he is hoping to go one step further in the One Day Cup. “It will be our second final this year and speaking personally, as a coach in his first season, it would be a dream final,” he said. Toyana put the Lions’ impressive run of form this season down to a change in the team’s mindset. “We chatted at the start of the season and we spoke about how in the past we had been quite happy to settle for draws in the four-day cricket. But we want to compete and win trophies for the franchise. We want to bring the glory days back to Johannesburg,” he explained. In contrast to the Lions, the Knights have endured a wretched season with their line-up being decimated by injuries and national call-ups. The central franchise are currently in fifth position on the log after just three wins from their nine matches but still have an outside chance of making the playoffs if other results go their way. The Knights are three points behind the third-placed Titans and must hope to win their match against the Highveld Lions and hope that the Titans lose to the Cape Cobras and the Dolphins lose to the Warriors. The Knights may have lost key players but coach Sarel Cilliers is not using that as an excuse for their season. “When you lose batsmen like Reeza Hendricks, Dean Elgar and Morné van Wyk it takes something out of your side. But it does give an opportunity for other players to show what they can do. But we are not using it as an excuse. We’ve had chances to win games this season and we haven’t taken them,” he explained. Cilliers said that there was no point worrying about the permutations for his team. All they could do was beat the bizhub Highveld Lions and hope for the best. “All we can do is play our best cricket and try to beat the Lions and then have a look at the other results. If it works out for us that way we would be very happy to play in the playoff,” he said.